Another long Minnesota winter is almost past us and the promise of spring beckons. Before you get busy with spring activities, it is important to take a look at your roof for any damage caused by ice and snow. Your roof is the most vulnerable to damage in wintertime, and a thorough inspection can detect any problems that might have cropped up as a result. 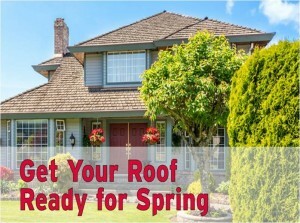 Wait for spring weather to dry out your roof. Walking on a wet roof is foolhardy and there is a chance you can slip and suffer serious injury. On the inside of your home, look for water stains and damp or cracked plaster – both are sure signs that snow has damaged your roof. Inspect the chimney and the ventilation pipes for any signs of damage or leakage. Check the underside of the roof from the attic. While you are up on the roof, check the eaves and gutters thoroughly to see if all the vent caps are in place and if the flashings are tightly fitted. If, in the past, you had used cement or sealant to repair any part of the roof, now is a good time to see if it is still in place. Inspect all the joints and turns carefully to make sure that they are still in place and there are no cracks or gaps anywhere. Usually minor problems can easily be set right with some simple tools like nails, a hammer, a caulking gun, palette knife, and some sealant or cement. Of course, a ladder and appropriate safety equipment will be needed. Let someone know that you’re on the roof and have them check on you frequently. Fill in any cracks along the flashing with caulk. Look for any missing or broken nails, and make sure you use roofing nails for replacements. In the event a whole width of shingle has to be replaced, the old one will have to be removed first. Any nails left back will have to be pulled out before the new shingle can be put in. Taking time now to check your roof for problems will not only lengthen the life of your roof, but it could prevent expensive repairs later.